Unlike Detroit, at least BMW will make an appearance at its home market show. Auto shows are apparently becoming a drag for automakers, and that’s a real shame for those who love attending to see what’s new. As we previously reported, . The main reason being is that shows are very expensive to do and both automakers don’t feel the investment is worth it, all the more so because neither will have anything new to present next January. But according to , via German publication Handelsblatt, BMW has decided to scale back its presence at the next Frankfurt Motor Show, scheduled for September 2019. Yes, BMW is actually cutting back on its own domestic market show. Previously, BMW spent roughly $30.6 million on Frankfurt, a figure that’s been reduced to $7.3 million for next year. But don’t think the automaker is going to hand out bonuses with the saved money. Instead, it the money will be invested in up and coming technology shows, such as the Consumer Electronics Show (CES) in Las Vegas, the Mobile World Congress in Barcelona, and some car shows in China. Frankfurt also happens to be the world’s largest car show. For example, the exhibition hall BMW previously occupied is around 36,000 square feet. Come 2019, BMW will take up a space of just under 10,000 square feet instead. What will be interesting to see is whether BMW’s main rivals, specifically Mercedes-Benz and Audi, will follow suit. Audi, of course, is part of the Volkswagen Group, and we highly doubt VW will bail completely on Frankfurt. Same goes for Mercedes. However, we wouldn’t be surprised to see both, at least at some level, also cut back on their next Frankfurt exhibition for the same reasons as BMW. It’s the start of a trend show organizers and venues don’t like to see. 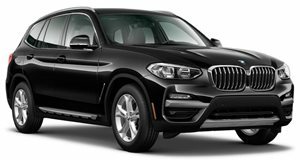 Even in a packed SUV market, the BMW X3 is a top choice to consider.